Pictured at left is my favorite photograph of Martin Luther King, Jr. It depicts those two great heroes of civil disobedience, King and Gandhi. 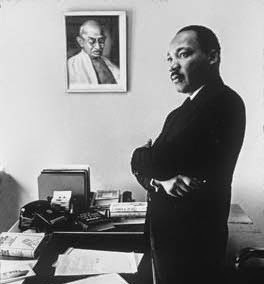 The influence of Gandhi on King's nonviolent approach to gaining basic human and civil rights for African-Americans is well known. Both used non-violent civil disobedience to change the world for the better. Their nonviolent model became the template for the anti-Vietnam War movement of the late 60s and for countless other protests aimed at bringing light to issues ignored by the establishment over the past 50 years. For those of us in education an issue of currency is standardized testing. Secretary of Education, Arne Duncan, has responded to recent criticisms, often from conservative groups, of the over use of standardized tests by doubling down on continued yearly testing in math and literacy. He argues this is the only way that parents can know how their children are doing in school and if the schools are performing up to snuff. A coalition of civil rights groups agrees with Duncan. According to these groups, as reported in the Washington Post, the annual testing has "unmasked yawning achievement gaps and forced all states and school districts to focus on poor and minority students, including those with disabilities." I am loathe to disagree with a group of civil rights advocates, but as a lifelong educator, I can tell these folks that they are wrong on this issue. While standardized tests may purport to unmask achievement gaps, the only thing that they really shine a light on is income inequality. I could as easily measure that by looking at the average value of a home in the child's school district. What standardized tests do, in actuality, is provide a bludgeon for those who seek to privatize education. These corporate privatizers can point to low test scores and blame teachers, unions, and school administrators for the failures of our public educational system. They can then propose solutions that take away local control of schools, turn schools over to for-profit companies, open charter schools of questionable quality and with lax oversight, and say they are trying to solve the problem. None of these solutions will improve the quality of education for children living in poverty (now 51% of all public school children). Nothing short of a full frontal attack on poverty will narrow the achievement gap. Money spent on "measuring the gap" with standardized tests is wasted tax dollars. Better to invest the money in real anti-poverty programs. So, what can we do to combat the over testing of all school children to no real purpose. I suggest taking a page from Dr. King by practicing civil disobedience - opt out of the tests. The government can offer you no compelling reason to have your child take the test. If you want to know about your child as a learner, ask the teacher. If you want to know how your school stacks up against other schools, ask a local realtor. If you want effective and non-intrusive test data on how your state is doing, look at the National Assessment of Educational Progress (NAEP) scores. Standardized tests given three times in your child's twelve years (say in third, eighth and eleventh grade) in school will give you plenty of information about how your child and your child's school is performing. If you would like to learn more about opting out I suggest you join the Opt Out facebook page here and visit the United Opt Out website here. To learn more about the abuses of over-testing I suggest reading the work of Fair Test here. I have no idea how Martin Luther King would feel about the yearly testing of students. Perhaps he would side with the civil rights groups who argue that the testing insures that "every kid counts." I think these groups are wrong, and I believe Dr. King would defend my right to say so and take action accordingly.